The G20 is considered an important and powerful forum of the Heads of Governments of 19 major economies and the European Union for cooperation on international economic and financial issues. The club was created in September 1999 as a forum of the Finance Ministers and the Central Bank Governors of the 19 major economies and the EU in the aftermath of East Asian crisis of 1997. Seven major industrial countries – Canada, France, Germany, Italy, Japan, the UK and the USA – took the initiative to create this grouping so as to promote consultations and coordination with emerging and developing economies in view of some of these key countries not sufficiently involved in the discussions and decisions concerning global economic issues though their influences were growing in the international financial system. In 2008, on the invitation of the then US President George Bush, Heads of States of the 19 major economies and the European Union met in the aftermath of the global financial crisis of 2008 and decided that G20 acts like a crisis manager group. G20 member states represent 85 per cent of the world's GDP. Argentina, Australia, Brazil, Canada, China, France, Germany, India, Indonesia, Italy, Japan, Mexico, Russia, Saudi Arabia, South Africa, South Korea, Turkey, the UK, the US and the European Union make the G20. India’s turn to host the G20 summit is scheduled for 2019. Germany will host the summit next year. 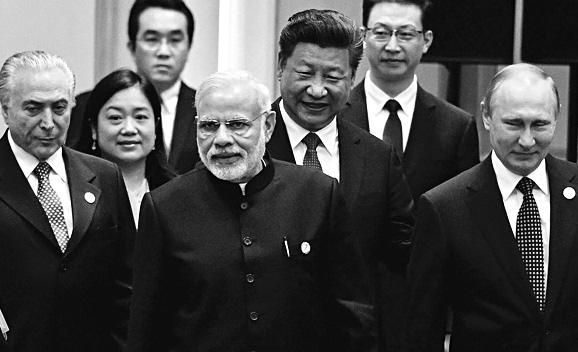 At the just-concluded summit, India used the G20 platform to underline the fact that effective financial governance can be ensured if corruption and black money are fought successfully. This year’s G20 Summit was held on September 4-5 in the eastern Chinese city of Hangzhou. Addressing G20 leaders, Prime Minister Narendra Modi asked them to act to eliminate safe havens for economic offenders, unconditionally extradite money launderers and end excessive banking secrecy that hides the corrupt. “G20’s efforts should be for zero-tolerance for corruption and black money; zero administration, policy and treaty loopholes; zero barriers and full commitment to action,” he said. He said to achieve effective financial governance "we need to act to eliminate safe havens for economic offenders, track down and unconditionally extradite money launderers and break down the web of complex international regulations and excessive banking secrecy that hide the corrupt and their deeds". According to him, a stable global economic and financial system is imperative for development as it promotes inclusive and sustainable growth and there is also a need for further strengthening of the global financial safety net. “We meet at a time when the global situation faces complex political and economic challenges. A frank, even a difficult conversation won’t be enough. What G20 needs is an action oriented agenda of collective, coordinated and targeted action,” he said and stressed on the need to improve financial system, boost domestic production, enhance infrastructure investment and create a pool of human capital. At last year’s summit in Antalya in Turkey too, the Prime Minister had said, G20 must continue to give priority on combating corruption and appreciated the efforts by the private sector in promoting transparency and integrity. He had also pitched for deepening cooperation against terrorism financing, including through targeted financial sanctions and more effective counter-terrorism financing tools. Seeking greater global cooperation for return of illicit money stashed abroad, he had said, “We must address the barriers of excessive banking secrecy, and complex legal and regulatory frameworks." The G20 is implementing its Anti-Corruption Action Plan which is helping to strengthen the global response to corruption, including through actions to address bribery, improve whistle-blower protection, enhance transparency and strengthen international cooperation through increased adherence to international agreements such as the United Nations Convention Against Corruption. G20’s work on transparency cuts across the growth and resilience agenda, in particular members are addressing tax, investment and market transparency. The G20 also recognises that information transparency is important for countries at all stages of development. India also apparently received a boost at the summit as the member countries could not reach on a consensus to ratify the December 2016 deadline to sign the Paris Agreement on climate change. During the Paris climate meet last year, more than 190 nations had agreed on setting ambitious goals for capping global warming and funnelling trillions of dollars to poor countries facing climate catastrophe. The agreement will come into force after it is ratified by at least 55 countries that account for 55 per cent of global greenhouse gas emissions. While Western countries including the US has been supporting an early ratification of the pact, India has been seeking more time to complete its national processes as it fears that any hasty decision may impact its developmental projects. According to Mr. Modi, though the Paris Agreement showed the way forward, "focus shouldn't just be on early ratification, but full success." "Many global issues may not seem economic but, carry significant economic cost," he told the G20 leaders, adding, we have to safeguard climate justice and it requires affordable financing and environmentally sound technology for developing countries. India warded off pressure from China and the US at the summit as the two countries tried to set 2016 as a deadline to ratify the climate deal after they both ratified the pact and handed over the instruments to the UN. India said it and several other countries believe they cannot ratify the deal due to various legal impediments. India further said it was not ready in terms of domestic actions to ratify before 2016 end, but will do so at the earliest. Finally, the G20 members agreed to complete their domestic legal formalities for the ratification of the Paris deal as soon as their "national procedures allow". This will provide more time to India to work out its own strategy keeping up with its developmental goals. "We reiterate our commitment to sustainable development, strong and effective support and actions to address climate change. We commit to complete our respective domestic procedures in order to join the Paris Agreement as soon as our national procedures allow," said a joint communique issued at the end of the G20 summit. Over the past few years, the G20 has been working to ensure international policy cooperation in a coherent manner that is consistent with the contextual business cycles; strengthen the financial system, improve the international financial architecture and regulation in an interconnected world to avert and prevent global financial crisis. It has also been promoting economic growth and sustainable development by addressing the current economic problems, by suggesting measures and initiating actions. G20 aims to foster and adopt internationally recognized standards through the example set by its members in areas such as the transparency of fiscal policy, global tax network and combating money laundering and the financing of terrorism. Indian leaders over the years have voiced their concerns on rebalancing global governance by reforming global financial institutions, checking global macroeconomic imbalances, checking protectionist measures and widening of G20 agenda to include development issues among other measures. Various other officials who take part in G20 Working Group meetings have also been voicing these concerns. India is represented in the G20 Leaders’ Summit by the Prime Minister while the Finance Minister and the Governor of the Reserve Bank of India represent in the Finance Ministers and the Central Bank Governors meetings. Ministerial meetings are represented by Cabinet ministers of the respective ministries. Other official level meetings are attended by the Joint Secretary, the Director and the Deputy Secretaries of the G20 Secretariat. The G20 India Secretariat was established in the Multilateral Relations Division of the Department of Economic Affairs, Ministry of Finance to coordinate work on all the G20-related matters in the government. G20 India Secretariat provides secretarial and technical support to the Apex Council on G20 issues, under the Chairmanship of the Finance Minister, established to provide direction to the preparation of policy and country response to issues contemplated in the G20 and to advice the Prime Minister as required; and to consider any other issues of international economic relations or issues that may have wide policy ramifications that may be referred to the Apex Council by the Department of Economic Affairs. At the G20, the European Union is represented by the President of the European Council. After the inaugural meeting of the Heads of Governments in 2008, the forum met biannually in 2009 and 2010 and annually since 2011. “Through consultations and cooperation, the forum played a major role as a crisis manager and successfully contributed in averting further serious consequences of the global financial crisis. Some major decisions in this regard are worth mentioning. In November 2008, the G20 Leaders agreed to regulate the hedge-funds and the rating companies, and sought to strengthen standards for accounting and derivatives. In April 2009, the leaders pledged USD 1 trillion to the IMF and the World Bank to help emerging market countries to offset the effects of recession. In September 2009, the leaders established a Financial Stability Board to implement financial reforms. Also they took decisions to regulate tax havens, and more than deserving executive pay increase in the banks and financial institutions. In June 2010, the leaders agreed to cut their budget deficits to half by 2013 and to eliminate deficits altogether three years later. In November 2010, the G20 Leaders agreed to bring Development agenda under the G20 discussions,” says the G20 website. G20 is now perceived as a global decision making forum for contextual critical global issues that are important for achieving sustainable growth and maintaining stability. G20 is working towards strengthening the financial system and fostering financial inclusion to promote economic growth, improving the international financial architecture in an interconnected world, enhancing food security and addressing commodity price volatility; and to promote sustainable development, green growth and the fight against climate change. The key challenge for the G20 at the current juncture is to ensure that international policy cooperation is sustained and enhanced in a coordinated manner to be coherent and consistent with the business cycles. G20 also aims to foster and adopt internationally recognized standards through the example set by its members in areas such as the transparency of fiscal policy and combating money laundering and the financing of terrorism. Over the last few years of its existence, G20 has developed a system and process of working. G20 does not have any permanent Secretariat. The Presidency is held on rotation by the member countries. Three countries – the previous Chair, current chair and the future chair – constitute what is known as “Troika” in G20. There are broadly two channels through which discussions are held and recommendations are arrived at: (i) The Finance Channel and (ii) Sherpa’s Channel. The finance Channel comprises of the Finance Ministers and Central Bank Governors and their Deputies. In the Sherpas channel, every member country of G20 has nominated a Sherpa to lead the Development agenda discussions. The Sherpas have been tasked by their Leaders to negotiate the Summits documents on their behalf. Thus, Leaders’ Declarations are finalised by Sherpas. NITI (National Institution for Transforming India) Aayog Chief Aravind Panagariya was India's Sherpa at the Hangzhou Summit. The G20 also maintains close association with international organizations which provide expert support and advice according to their respective competence besides reports and position papers relating to the Agenda Items. Some of these organisations are the International Monetary Fund (IMF), the World Bank (WB), the Financial Stability Board, the Organisation for Economic Cooperation and Development (OECD), the World Trade Organization (WTO), the United Nations, UNCTAD and International Labour Organization (ILO). The objectives of G20 are Policy coordination among its members in order to achieve global economic stability and sustainable growth, to promote financial regulations that reduce risks and prevent future financial crises and to create a new international financial architecture. These objectives are pursued through common agenda that are continued and followed up over years. In addition, each year, the G20 Presidency has the privilege to decide its priorities within these broad objectives. The priorities are announced by the Presidency after assuming the Chair. These priorities then shape focus in G20 meetings in the year.